HP has incorporated an interesting option for running VMware ESXi 4 from flash. Instead of using a USB stick, an SD card can simply be popped in the embedded reader. While any SD card would work, HP emphasizes that only a specific model is fully supported — the ones I received are actually made by Lexar and the official nomenclature is: HP 4GB SD Flash Media, Part Number 580387-B21. You may also be interested in articles from Rick Scherer and TechHead on this topic. Sure, Hyper-V Server — but not Windows Server 2008 with Hyper-V — supports boot-from-flash when purchased from a server OEM, but to the best of my knowledge there are no vendors shipping such configurations at this time. Note that Microsoft recommends a 16GB flash drive for Hyper-V Server deployment (compared to a slender 1GB for ESXi 4), but a PlayStation Portable is an acceptable substitute in a pinch. Why would you run VMware ESXi from flash? If VMware ESXi 4 is so small, why is it so big? Thats all great, etc, but HP recently released a critical advisory saying that the USB methods are apparently risky and can cause problems. I’m not at my usual work machine so I don’t have the advisories handy. They focus on the SD card method, which is great, but not for users who have already implemented one way on their blades, or frankly if they have G5 models (as my company does) compared to G6 models. So now I’m not supposed to use the internal usb method anymore, but I have this awesome SD card method which I can’t use at all since I don’t have the slot. HP really needs to announce that a replacement USB drive has been found that doesn’t have the problems of their original, or can ship me replacement blades. Either or. Brandon – do you have a link to the HP Critical Advisory you referenced? If you have the SD slot – use it. Check the SD class ratings for better performance (2/4/6 MB/sec) which can affect boot times. If you’re logging to SD, try to find a class 6 card. 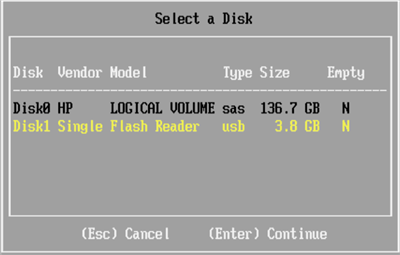 We’ve been running ESXi from USB flash in the lab and in SMB’s since 3.5 without issues. It is especially handy for white box lab and laptop installs where on-board HD controller may not be supported. I have done the same items as you with great success. One question that I have is where have you configured the Scratch to point to? I have seem iSCSI / NAS connections for this but wondering if the SD Card can be used for this to keep it local. Thoughts? 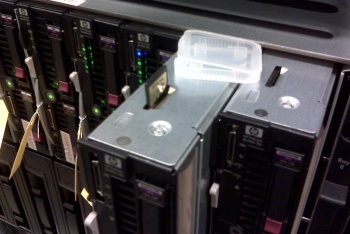 I’m considering this on my DL360 G6 servers to eliminate the need for 1 (or 2 in RAID 1) 72GB SAS drives. A considerable amount of savings in purchase costs when you scale it up. However, for now, I’m planning on purchasing an 8GB SD card for each of our existing servers to load up the VM Installation media for remote reinstallations. iLO remote media isn’t always as reliable as I would hope. is really intereting from the perspective of total disks cost. -> about the price of a brand new BL360 additional blade + saving 1000$ ! in production to run several VM’s/host. SCSI is by far more speedy than USB ctrl or SD. So are there any I/O contraints to consider when using such solution ? Or I’m out of subject ? The only tradeoff that I am aware of with USB flash is slightly longer boot time. After that, the USB flash is mostly out of the picture — everything is in memory. To use the SD card for installing VMWARE, do I just copy the .iso file onto the card? And then at boot pick that file and it will launch into the install script? This would be similar to using the USB port in the back of the Onboard Administrator.